A person's worst nightmare, being eaten alive from the inside by a creature you can't even see, was realized in New Jersey. A 29-year-old man died this money after contracting what is being described as "a brain-eating amoeba". Fabrizio Stabile died one day after he was diagnosed with the brain-eating amoeba called "Naegleria fowleri", a rare infection that has only been diagnosed a total of 143 times in the last 55 years. The amoeba is said to be found in fresh water, but Stabile had been at a wave pool at BSR Cable Park in Waco. After visiting the wave pool, Stabile began suffering from a headache while mowing his lawn. Later that day on September 16, he went to lie down and less than a week later he was pronounced dead on September 21. 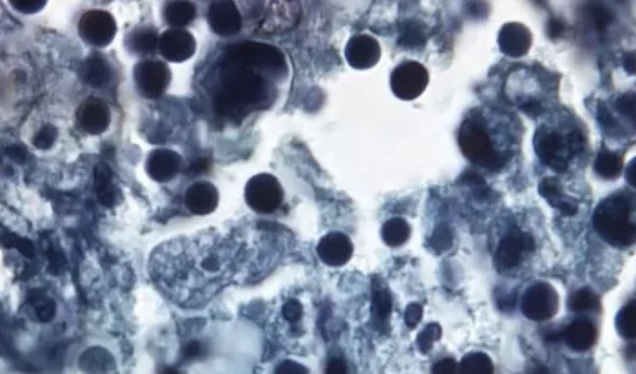 The Naegleria fowleri amoeba typically infects people when contaminated water enters the body through the nose, according to the CDC. The parasite then travels to the brain after entering the nose where it can cause a fatal infection called primary amebic meningoencephalitis. After one is infected, symptoms can start to show as soon as one to nine days later and within one to 18 days the infected person is dead. At first, friends and family of Stabile weren't sure what he was suffering from. He took headache medicine on September 16 which helped him sleep through the night but when he woke up the next day, the headache was still there. A GoFundMe page set up for Stabile said, "He asked his mother for more medicine and went back to sleep. When his mother went to check on him in the early afternoon, Fabrizio could not get out of bed and could not speak coherently. His mother called 911 and EMTs rushed him to the hospital." Stabile's symptoms included brain swelling and fever which appeared consistent with bacterial meningitis. Doctors immediately sedated and treated Stabile with an aggressive neurological protocol and medication. "Unfortunately, Fabrizio was not responding to these measures and his condition was rapidly deteriorating," the GoFundMe page says. "He had been tested for a multitude of illnesses caused by various bacteria and viruses, but the results were coming back negative or inconclusive." On September 20, one of the test results came back positive for Naegleria fowleri and doctors brought his family and friends in the ICU waiting room to inform them of the bad news. The very next day, Stabile died at the Atlantic City Medical Center with his family and friends at his side, according to his obituary from Lowenstein-Saraceno Funeral Home. Stabile is described as an outdoorsman who loved snowboarding, surfing, and anything to do with friends and family. He worked for the New Jersey Department of Environmental Protection as well as Bass Pro Shops. His obituary reads, "Fabrizio will be remembered as someone with a contagious smile, who could lift the spirits of anyone and everyone he talked to." Friends of Stabile setup "The Fabrizio Stabile Foundation for Naegleria fowleri Awareness" to help inform people of the dangers of the rare infection. "We aim to do this through an annual fundraiser in Fabrizio's memory in hopes that this will not affect another family…Please help us in keeping Fabrizio's memory alive," the GoFundMe page said. Infection of the Naegleria fowleri amoeba typically occurs when people go swimming or diving in warm freshwaters such as rivers and lakes. Infection can also occur in rare cases when contaminated water from other sources enters the nose, such as from inadequately chlorinated swimming pool water or heated and contaminated tap water. Between 2008 and 2017, there were a total of 34 reports of the amoeba infections in the United States. Of those 34 cases, 30 of them were infected by recreational water. Three people were infected after performing nasal irrigation using contaminated water from the tap, and one person was infected by contaminated tap water which was used with a water toy. The Centers for Disease Control and Prevention is currently testing the waters at BSR Cable Park's Surf Resort where the wave pool is located.